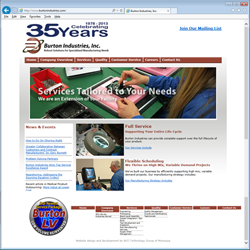 Project scope: As an electronic manufacturer, Burton Industries is doing their best to redefine the contract manufacturing relationship. Their business model is simple: if they help their customers become more competitive, their business grows. Their definition of “more competitive” is different for every customer. Some need a contractor who can fix their quality issues, others have trouble meeting variable demand, many want a contractor that they can trust to keep their projects moving smoothly without a lot of handholding and virtually all want help with cost reduction. In short, their model is based around figuring out what keeps their customers up at night and solving that issue. Bottom line, we are in the business of making your life easier by making your products better. 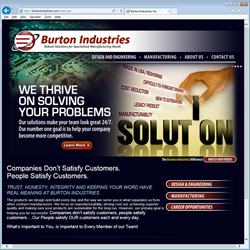 Design components: Burton's old web site was showing that it was outdated in it's design and presentation of information and it was time for a facelift with some new technology and a comprehensive review of the materials presented. New onsite photography was taken to ensure that the image of the company being projected was actually their company and not stock photography. A new site design was created using their existing logo (which was refined a bit) and also included a comprehensive review and rewrite of their existing content to ensure their message was fresh and up-to-date, which was done by their consultant Susan Mucha of Powell-Mucha Consulting.